Kfar Hanokdim is a desert hospitality site, located in the Kana'im Valleybetween Arad and Masada; an oasis of discovery in the Judean desert. Kfar Hanokdim is a desert hospitality site, located in the Kana’im Valley between Arad and Masada; an oasis of discovery in the Judean desert. 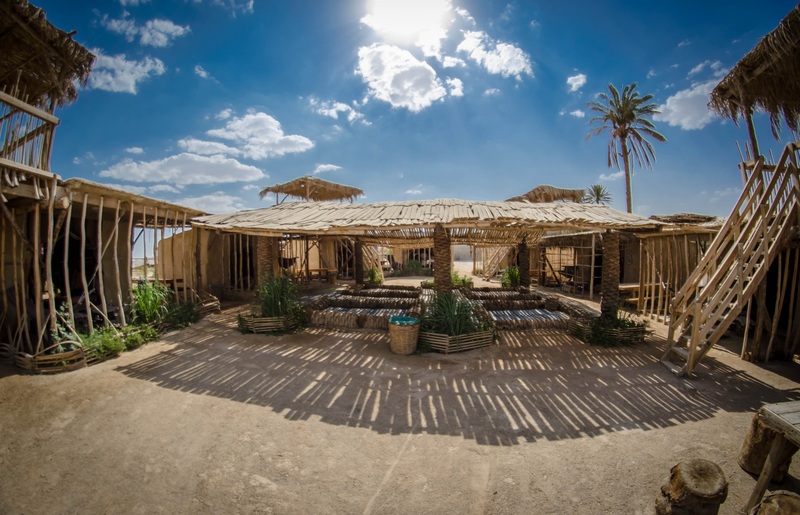 The site was established in 1991 by Yoram Roded, who was inspired by the spirit of the Sinai desert and embarked on a desert-style project, encompassing Bedouin customs and plays homage to the cultural significance of this group. Across the site, you will find accommodations and public spaces built entirely from local natural materials – stone structures, wooden crafted buildings, furnishings made from goat hair, and salt crystal lamps. Much of the 12 acre plot was designed and built by Roded himself, blending hand carved stone art and intricate water fountains into the scenic landscape. “We have many requests from people who want to experience desert camping and sleeping close to nature, but in a more private and comfortable setting,” says Media Relations Manager Joni Gritzner. “So over the years we expanded to offer more lodging categories.” Dotted throughout the site are tents made from goat hair, Bedouin style marquees (for larger groups), and “Sukkah” guest lodges, constructed from natural materials, with sleeping futons, a cooking area and on-site bathrooms. “The lodges were built to offer a more luxury desert experience. It’s still camping, but in finer surroundings,” explains Gritzner. Our accommodation for the night is a private desert-style room, which is designed with handmade furniture, comfortable beds and has the added benefit of air conditioning and en-suite bathroom. A short walk through the site and we discover all its glories – a public lobby serving soft drinks and fruit, gift store, events hall, bonfire areas and the odd meandering peacock. “We organize a range of entertainment, depending on the time of year and who is visiting, including a petting zoo, traditional Bedouin activities and a green workshop demonstrating ideas on how to utilize different forms of energy,” says Gritzner. “Every guest can also enjoy a camel ride through the desert.” We take a seat at the camel ranch to watch a five minute video explaining the history and nature of camels, putting our minds at rest before we saddle up for a 30 minute desert trek, permitting us a spectacular view across the breathtaking terrain. Time at Kfar Hanokidm is a real cut off from civilization – there’s no Wifi and cell phone reception is intermittent – in reality, providing much needed breathing space. By evening, the site is lit from the glowing lanterns, and a serene ambiance sweeps across the grounds as we make our way to Gandy dining room for dinner, an open structure, made from mostly wood and palm leaves, offering views of the desert from every direction. “You will notice that we are not fenced in from any direction, every space is intentionally kept open in order to better connect with nature,” explains Gritzner. Dinner is a spread of salads, potatoes, rice, a hearty offering of fish and meat stews and dishes, with traditional Middle Eastern cakes and treats for dessert. After dinner we make our way to a group bonfire, where a drumming circle is underway, an energetic rhythm echoing across camp, under a sky of twinkling stars. At 5.30am, we tiptoe through the sleeping camp site to our car and drive the 15 minute winding road that leads to the western entrance of Masada National Park, a United Nations World Heritage site with a monumental history. It takes less than 20 minutes to reach the peak, where we are met with dramatic views across the Judean desert, Dead Sea and the rising morning sun. A rousing start to the day. Our experience at Kfar Hanokdim was relatable to that of a destination resort – one tucked away within the desert valley, providing the perfect respite for those seeking a unique city escape.